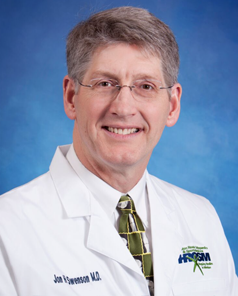 I started working at HROSM in July 2003 and since then I have been working with Dr. Swenson for the majority of the time. Over the last 15 years, I have developed a great respect for his work as a surgeon, not to mention his compassion and bedside manner with each of our patients. Dr. Swenson treats a wide range of orthopaedic issues for a variety of ages, but after working with him for so long I have come to realize he enjoys total knee replacements the most. His background in engineering and his knowledge of implants are part of the reason he enjoys performing total knee replacements. Surgery is something he truly loves to do but Dr. Swenson is conservative in his approach to treatment and will always put the patient first. He always takes his time to explain at length to his patients what their diagnosis is and treatment plan. Always offering time for the patient to explain their symptoms along with other concerns they may have. We have developed a team approach in the care that we provide to each patient; from the time a patient steps into our clinic to the time they leave the office. This process cannot be done efficiently without everyone on our team; we are like a ‘well oiled machine.’ They are truly my second family from Lauren Labra, PA-C, Linda Rice, surgery scheduler and Chris Rodriguez, MA; we each play a integral role in the care provided by Dr. Swenson.